¿Qué sería de mi vida sin Cocteau Twins? Suena enfermizo y fanático, y no es para menos. La banda más influyente y original de los ochentas y noventas crea dependencia con su celestialidad sonora. Los 'gemelos' son exploradores de emociones que surcan los senderos con emotividad y dulzura musical. Cada día puedo sentir algo distinto oyendo a los Cocteau. Y es cierto, que difícil sería para mí vivir sin ellos. Les dejo una frase de la bella Elizabeth, privilegiado ser, dueña de la voz etérea más hermosa que he podido escuchar. Una muestra de sacrificio, de un todo por nada. la esencia de todo verdadero artista. Liz Fraser se envuelve en dolor y sufrimiento para regalarnos bellas sensaciones y vida. Excelente!! !, no conocia el "Live in London" Me he llevado mas de una agradable sorpresa escuchando cada uno de las canciones en vivo. (sobretodo algunas como "Sugar Hiccup" y "Loves Easy Tears") Muchas gracias por aquel post. P.D- Por favor, podrias subir algo de Ultravox, sobretodo el video "Passing Strangers"? Te invito a pasar, me gustaría también hablar contigo. I like this blog a lot.I'm an 80's fan as I'm 43 I mostly know or have seen the bands you post here.I was amazed to find a live Cure concert from '81.You even have a ticket.I attended this concert so I downloaded it right away.When I try to open the RAR file I always get the message "wrong password" although I put oriani_k in the password box.What am I doing wrong.I really need that album or I may perish and my children and grand children wouldn't be able to listen to great music from the past. Hola, welcome to the blog. Well, the ticket actually(indeed) is not my, simply it is a reference. It is something historical, because of it I put it. I had liked to be there that time. As for the mistake of the password, it is necessary to to that the file has not stooped correctly. It (he,she) tries to lower it again. If this does not change write to me again and I raise it again without pass. Other persons have been lowering it without problems. Thank you very much for your commentaries, and do not worry that your children were listening anyhow to this great music. I am using a translator to be able to communicate with you, the truth is that I do not know nothing of Englishman. The link to part two is dead. The part 2 already is arranged, you can lower it. Thank you for visiting itself!!! open with the password ?? 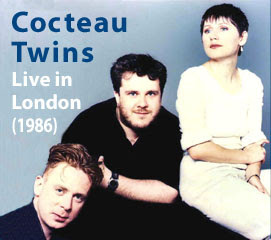 and thanks that very rare cocteau twins stuf' ! Do not copy and give it, I recommend to you to write it. Hi, for starters, this is one of my favourite bands ever, if not the one. Just a few time ago I have known of the existence of this "Live in London (1986)" and that it was limited to a 1000 copies, can you tell me if you have this in original or how did you get this album? Just to end this, I would like to thank you to have this jewel for upload. hola a todos, no encuentro el pass para bajar los 2 archivos de cocteau twins en concierto. Hola, estoy preparando una biografía narrada con canciones de esta mítica banda Cocteau twins, espero su apoyo para la difusión de este arte sin nombre. Edwyn, cuando quieras... aquí hay un apoyo.